The broader NSE Nifty index too finished lower by 4.80 points, or 0.05 per cent, at 10,632.20. A slew of FDI reforms failed to enthuse the markets on Wednesday as participants held back fresh bets ahead of the corporate results season. In big bang reforms ahead of the Budget, the government today permitted foreign airlines to invest up to 49 per cent in debt-ridden Air India, and eased norms for investment in single brand retail, construction and power exchanges. 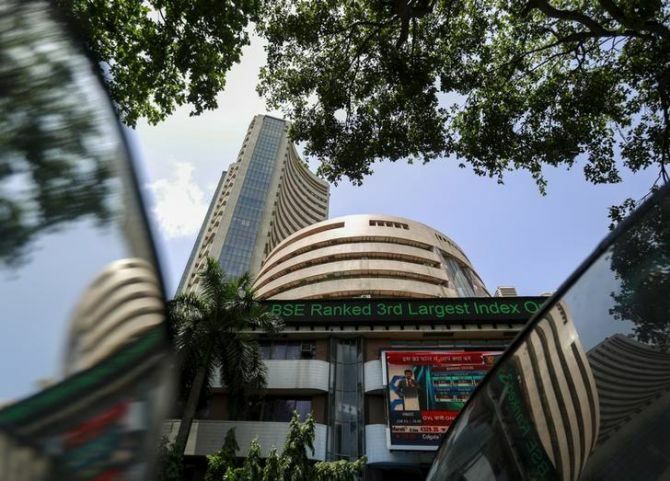 However, the benchmarks Sensex and Nifty slipped from record highs as caution crept in ahead of the earnings season, which will kick off tomorrow with TCS announcing its Q3 numbers, followed by Infosys on Friday. The 30-share Sensex opened with strength and rallied to a fresh life-time high of 34,565.63. However, it succumbed to profit booking, before finally ending at 34,433.07 points, down by 10.12 points, or 0.03 per cent. The gauge had rallied 649.81 points in the previous four sessions on widespread buying and sustained foreign fund inflows. The broader NSE Nifty index too finished lower by 4.80 points, or 0.05 per cent, at 10,632.20. Intra-day, it hit a high of 10,655.50 and a low of 10,592.70. "Investors turned little nervous ahead of earnings season while outperformance of IT index on account of relief on US H1B visa norms and expectation of positive outlook helped to recoup the losses. "Though the market trend is positive we are bound to see some volatility in the short-term. Caution before the final budget outcome, CPI inflation and oil prices may impact the premium valuation," said Vinod Nair, Head of Research, Geojit Financial Services. TCS was the biggest gainer in the Sensex kitty, rising by 3.64 per cent, ahead of its results. Sector-wise, the BSE IT index emerged on top after the US administration clarified that it was not considering any proposal that would force H-1B visa holders to leave the country. Brent crude hit $69.16 per barrel today -- its highest level since 2014 -- due to ongoing production cuts led by OPEC and a dip in the US rig count. Most Sensex constituents ended in the red, including Dr Reddy's, NTPC, Asian Paints, Bajaj Auto, SBI, Tata Motors, HDFC Ltd, Bharti Airtel, L&T, Power Grid, ITC Ltd, Hero MotoCorp, Yes Bank, Axis Bank, Sun Pharma, Kotak Bank, M&M, HDFC Bank, Tata Steel and ICICI Bank. Gainers included TCS, Wipro, Coal India, Adani Ports, Infosys, IndusInd Bank, ONGC, HUL and RIL. In sectoral terms, the BSE auto index fell 0.68 per cent, followed by consumer durables 0.65 per cent, capital goods 0.37 per cent, PSU 0.33 per cent, bankex 0.31 per cent, power 0.20 per cent, FMCG 0.14 per cent and healthcare 0.09 per cent. IT, teck, realty and metal finished with gains. The broader markets too succumbed to profit-booking. The mid-cap and small-cap indices lost 0.31 per cent and 0.04 per cent respectively. Globally, Asian stocks slipped, with investors taking profits after three days of gains. However, Hong Kong's Hang Seng rose 0.50 per cent, while Shanghai Composite Index gained 0.25 per cent. European markets too turned negative in late morning trade as key indices Germany and France retreated by up to 0.36 per cent. London's FTSE, however, rose 0.24 per cent. 10-year ELSS to save tax: Should you buy? Is it time to consolidate your loans?